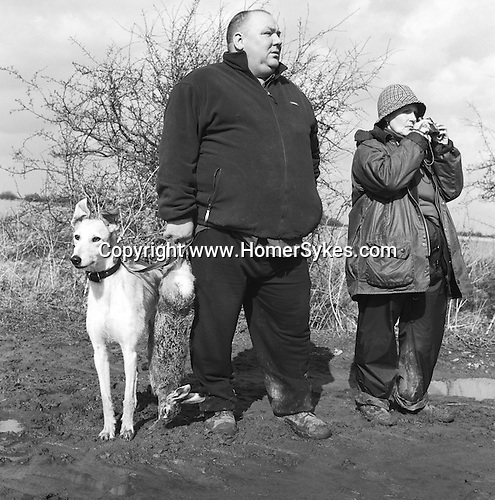 Rat and Rabbit and Lurcherwork...Single handed Hare Coursing for Hare and Rabbit...John Armstrong from the North East Lurcher Club a guest of The Old English and Colonial Lurcher Club hunting in Lincolnshire on an extremely cold and blustery February day. Barbara Tyer wraps up to keep the wind and rain out....Hunting with Hounds / Mansion Editions (isbn 0-9542233-1-4) copyright Homer Sykes. +44 (0) 20-8542-7083. < www.mansioneditions.com >..